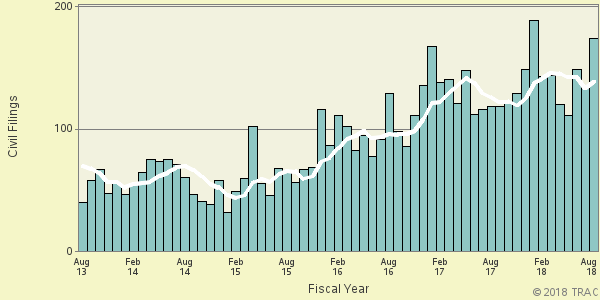 Habeas corpus filings in federal courts challenging the confinement of noncitizens continue to rise. The latest available data from the federal courts show that during August 2018 the government reported 174 new habeas corpus civil filings by noncitizens. According to the case-by-case information analyzed by the Transactional Records Access Clearinghouse (TRAC) at Syracuse University, this number is up 27.9 percent over the previous month when the number of civil filings of this type totaled 136. The comparisons of the number of civil filings for these habeas corpus actions are based on case-by-case court records which were compiled and analyzed by TRAC (see Table 1). When monthly 2018 civil filings of this type are compared with those of the same period in the previous year, their number was up (10.2%). Civil filings for August 2018 are also higher than they were for the same period five years ago. Overall, the data show that civil filings of this type were up 98.6 percent from levels reported in August 2013 (see Figure 1). The one-year and five-year change comparisons are based upon a six-month moving average so that natural fluctuations are smoothed out. Thus far during the first eleven months of FY 2018 (October 2017-August 2018), a total of 1,567 habeas corpus actions challenging confinement of noncitizens have been filed in federal district courts across the country. Where these types of suits occur is influenced by where particular detention facilities were located. These facilities are used by Immigration and Customs Enforcement (ICE) to house noncitizens who the agency seeks to deport. Forty-nine out of the ninety federal districts in the United States had at least one suit filed during this period. Relative to its population, the Northern District of Florida (Pensacola) had the highest number with a rate 11 times the national average. The Middle District of Georgia (Macon) had the second highest rate with over 9 times the national average. It was followed closely by the Middle District of Pennsylvania (Scranton) with just under 9 times the national average. In sheer numbers, the District of New Jersey with 233 new lawsuits had the most habeas corpus actions filed by noncitizens. Although in second place, the Middle District of Pennsylvania was far behind with 134 such suits. The Central District of California (Los Angeles) was third with 115 suits. For the remaining districts, see Table 2 for rankings along with relevant statistics on suits filed. * covers first eleven months (October 2017 - August 2018).